A muzzle can be a dog's best friend. The easy misconception is that only dogs who bite wear muzzles. While preventing bites is one appropriate use for them, there are plenty of other reasons to put a little safety barrier between his teeth and the outside world. For example, if your brand-new adult dog or foster dog hasn't been exposed to the dog park before and you have no clue how she's going to react, a muzzle can make the difference between trauma and calm. If a dog dislikes strangers at first and needs just a little time to adjust to them, a muzzle can provide a level of calm for nervous visitors. A muzzle will stop your dog from eating weird stuff she finds on the ground during walks. Every dog owner should follow the rules and when travelling in public places with his pet should keep him/her muzzled. Our Online Muzzle Dog Shop is ready to offer you wide range of dog muzzles for different purposes and needs. Travel or train your doggie properly with our durable and top quality dog muzzles. 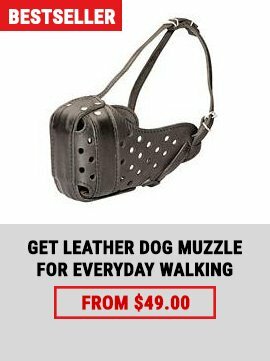 If you want your dog to attract attention of other people you should purchase our new Designer Leather Dog Muzzle with Nappa padding. Our craftsmen used special brass studs to decorate the muzzle and make its design extraordinary. Our product is very practical and long-service because it is made of 100% full grain genuine leather. Choose this amazing masterpiece and enjoy all its advantages! 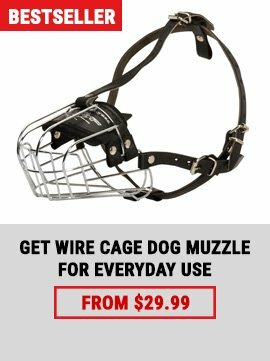 It is time to muzzle your lovely pet, isn’t it? Do you want to choose the most comfortable muzzle for training activities and safe walking? 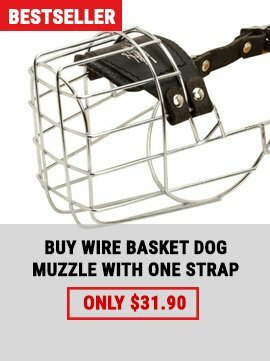 Then, we propose you to purchase this Amazing Leather Basket Muzzle that will fit for these purposes. Your dog chews the furniture? This muzzle will also help you. This super beneficial muzzle is exactly what your dog needs for happy and healthy growth.